As we lead the redevelopment and revitalization of Calgary’s most historic neighbourhood, CMLC’s commitment to arts and culture – important pillars of both the Area Redevelopment Plan and the Master Plan for East Village – is shaping the neighbourhood’s uniquely compelling character. Public art and a vibrant cultural scene make the neighbourhood more inviting, more engaging and ultimately more desirable as a place to live. Through our Art in the Public Realm program, which seeks to build a legacy of public art through permanent and temporary, curated art installations of local, national and international significance, CMLC is transforming Calgary’s oldest neighbourhood for the future while preserving its distinctive character and rich history. In April 2012, CMLC unveiled East Village’s first permanent art installation – a 24-foot high spectacle on the corner of 4th Street and 5th Avenue SE. Beckoning onlookers to this East Village gateway, Promenade by renowned contemporary British artist Julian Opie comprises a four-sided tower with 20 LED panels that display mesmerizing animations of people walking. Opie is considered one of the most significant pop artists of his generation – a leading figure in computerized art whose work is exhibited internationally. 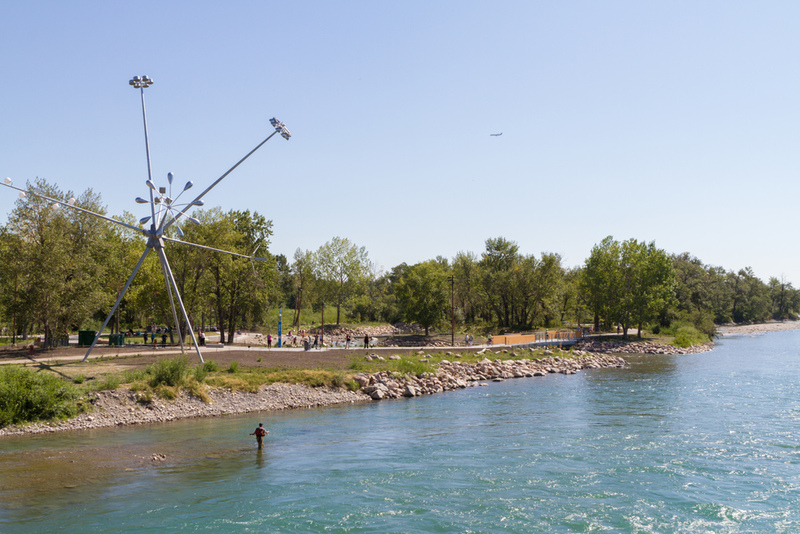 The largest work of its kind in the country and only the second Opie creation in Canada, Promenade reflects the flow of passers-by, of the Bow River, of traffic and of time through East Village – an artist’s inspired response to the character and energy of the environment. While the artist describes the work as “a marker for the new East Village – an identifier for the new life being created in this neighbourhood,” it is equally a tribute to the energy and sense of community that thrived here in the earliest days of East Village and the City of Calgary. The Art in the Public Realm program’s second permanent installation in East Village, this huge mosaic by Calgary artist Ron Moppett is 34 metres long and four metres high. A bright and beautiful depiction of Calgary’s genesis, evolution and future, it incorporates nearly a million unique pieces of tile and five panels that evolve from a ‘glacial whiteness’ to a Chinook, European immigration and a reference to William Reader, Calgary’s first superintendent of parks and cemeteries. The work’s central theme, according to the artist, is genesis. Starting from the south and moving north toward the Bow River along Riverfront Lane (our first pedestrian-only street), each panel tells a story of genesis – of a place and neighbourhood, of a city and province – delivered in a way that’s abstract, poetic, joyful, colourful and playful. The third artist commissioned for the RiverWalk temporary public art program was selected in Spring 2016. Curtis Van Charles Sorensen's installation represents his perspective on an authentic Canadian adventure - a new take on traditional wildlife and realism. 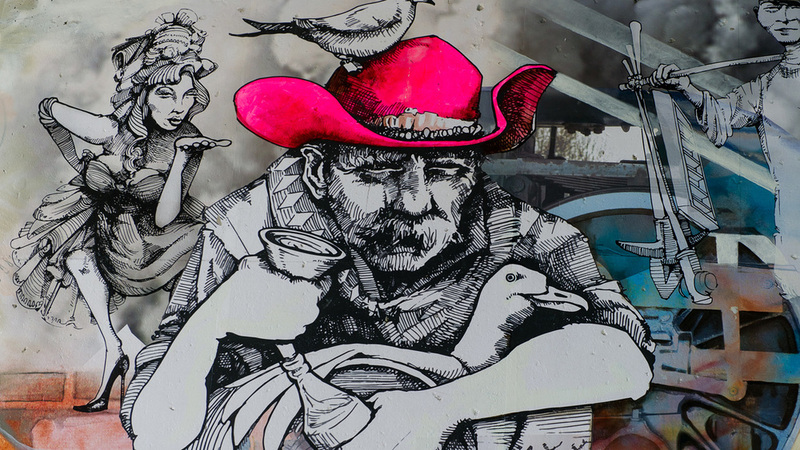 Adorning RiverWalk’s bridge abutments, storage sheds and signature washrooms until 2018, the Van Charles installation is a series of images that depict flowers, leaves and animals indigenous to Southern Alberta and the Bow River – the beaver, fox, coyote, heron and many others. Michelle Hoogveld explores themes of connectivity, community celebration, sport and gathering in her Corridor of Connection mural at the 4th St SE Underpass. 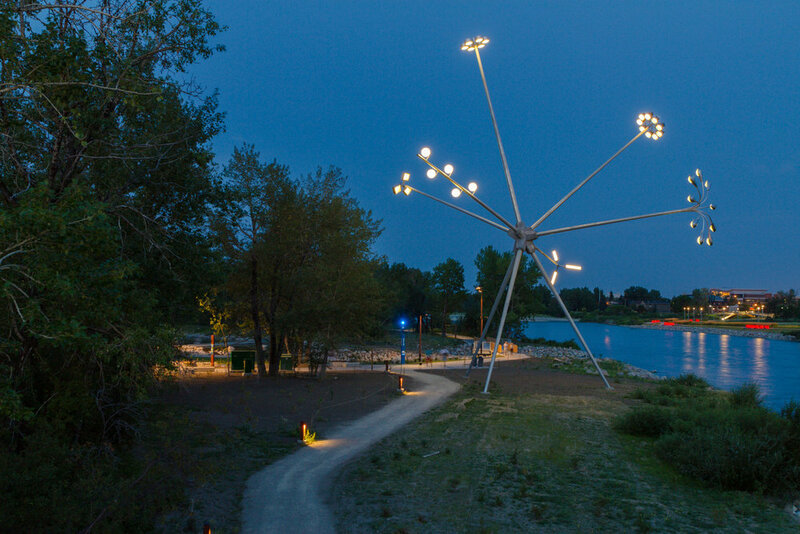 The themes depicted connect to not only the story of East Village’s transformation but also to the emerging vision for east Victoria Park as Calgary’s Culture and Entertainment district.